Layered salads have never gone out of style and this Taco Salad Stack is no exception. Updated with popular taco flavours, this attractive salad is sure to be a hit! 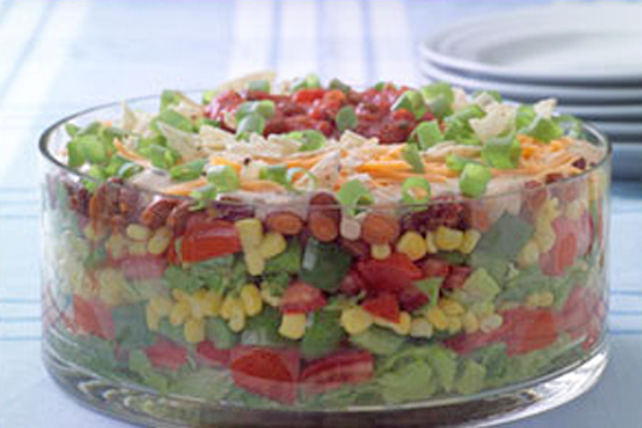 Layer half each of the lettuce, tomatoes, peppers and corn in large bowl; repeat layers. Top with beans. Mix yogurt, cilantro, dressing and chili powder until blended; spread over salad. This colourful salad can be prepared ahead of time. Layer all ingredients in serving bowl as directed, but do not top with cheese, crushed chips, salsa or green onions. Refrigerate up to 8 hours. Top with remaining ingredients just before serving. Sprinkle 2 cups chopped cooked chicken over first layer of lettuce.